If you’ve been searching for a 4x4 or AWD crossover or SUV, we have a brand new sales event that you need to know about! 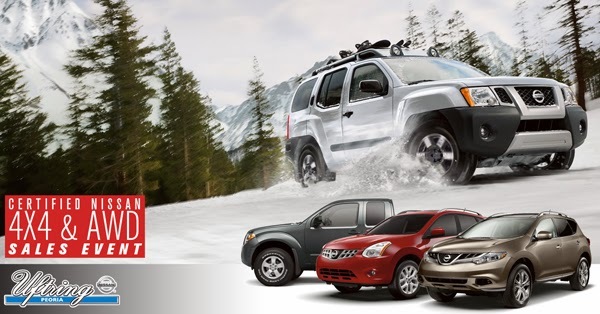 At Uftring Nissan, there’s a 4x4 and all-wheel-drive sales event going on that will save you more money if you want to make sure you can get anywhere – any time. This snowy and icy winter has made for some treacherous driving conditions, and its time to get a deal on a safer vehicle that you can trust. If you’ve never driven an AWD Nissan or want to try one out again, we want to get you behind the wheel as soon as possible so you can feel the control and stability. The Nissan Frontier is a midsize truck made for driving anywhere and everywhere. Equipped with the horsepower and engine you want, the Frontier will get any job done, from towing to off-road adventures. Some Nissan Jukes are equipped with all-wheel-drive – which makes every trip an adventure you’re sure to return from. If you’re looking for an AWD vehicle with an incredible feel for luxury and affordability, the Nissan Rogue SUV offers stability and reliability on terrain you otherwise couldn’t tackle. Ask about a $500 certified rebate or 0% APR on local trades and one-owner Certified Nissan vehicles – with approved credit. To view our current selection of inventory, click here to check out our AWD vehicles and click here to view our 4x4 Nissans.